The NYPD officer being praised for showing restraint in the way he handled a group of drunk vagrants coming after him on the subway speaks out. Andrew Siff reports. A New York City police officer is being praised for his brave and restrained response when a group of intoxicated homeless men went after him inside a subway station, where the officer was working alone. It happened late Sunday night, when a cop on a solo foot post inside the East Broadway subway station on the F line was told by a woman that she was being harassed by a group men inside the station, according to NYPD. The officer approached the men, who were visibly intoxicated, and asked them to leave the station, police said. The men refused to leave and became combative, and started tussling with the cop, cellphone video taken by a bystander shows. "Stand back. I don't want to hurt you," the cop shouted repeatedly at the men as they approached him, waving his baton at them. The officer kicked one of the men to fend him off, and another tried to go after the officer -- but ended up tumbling onto the tracks, the video showed. Police said the officer requested power be turned off to the tracks and for backup to arrive. The man was taken off the tracks and was expected to be fine. On Monday morning, Christmas Eve, officers returned to the same subway station and saw the men there again. They were taken into custody in local law violation of being outstretched in the station, police said, but the district attorney's office declined to prosecute the case, angering the police union. "Had it gone the other way, we might have had a seriously injured or dead police officer instead," said Patrolmen's Benevolent Association President Patrick Lynch. "It's wrong that they were not charged for attacking him." On Wednesday, the district attorney's office announced it would in fact charge the three men seen going after the officer in the video, saying the prosecutors who declined to move forward on the sleeping-related violations were not aware the men were also allegedly involved in the fight with the cop. Eliseo Alvarez, 36, was charged with attempted assault, obstructing governmental administration, riot, attempted criminal possession of a weapon and menacing. Juan Nunez, 27, was charged with obstructing governmental administration and riot. Police are looking for the third suspect. 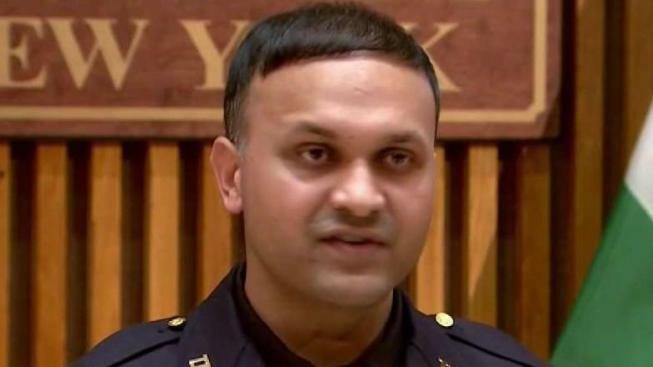 Meanwhile, the officer seen in the video, Syed Ali, was honored by Brooklyn councilman Chaim Deutsch on Christmas Day for his "quick action to defend civilians and himself against five individuals attacking on a subway platform." Deutsch said the officer showed restraint for not reaching for his gun. Mayor de Blasio also tweeted praise for Ali's "extraordinary professionalism and bravery," and said the NYPD would increase its presence at the station.